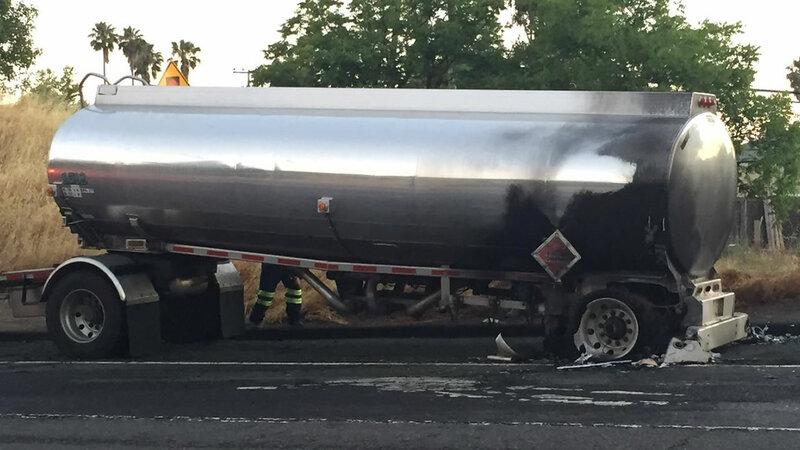 VALLEJO, Calif. (KGO) -- A tanker caught fire on Highway 37 in Vallejo Monday morning. This happened near the Fairgrounds exit. The ramp has reopened and the damaged tanker has been towed. Crews had to transfer the fuel to another truck before towing the tanker from the scene. The tanker fire was reported just before 2:30 a.m. on the westbound lanes of Highway 37 by the Fairgrounds exit. Firefighters found the rear tires and the tank of the semi on fire. "Crews realized it was a diesel tank and initiated fire attack, brought the fire under control in about ten minutes," Vallejo Fire Dept. Capt. Arthur Gonzales said. The tank was damaged but not breached, so nothing was able to leak.